Quick Study: Buida writes short stories, novellas, and novels that often contain historical, grotesque, and metaphysical elements. The Buida File: Yury Buida was first published as a fiction writer in the early 1990s after a career in journalism in his native Kaliningrad region. His novel Blue Blood, which uses literary allusions and quirky Soviet-era situations to transform Soviet actress Valentina Karavaeva into a fictional heroine, was a 2011 Big Book award finalist, winning third prize among readers. 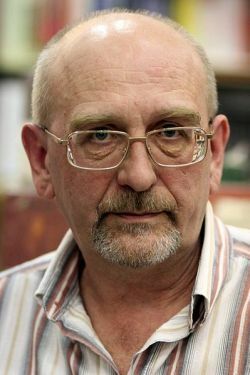 Buida’s work has also been shortlisted for the Russian Booker Prize, and he won the 1999 Apollon Grigoriev Award for his collection The Prussian Bride. Psssst………: Two of Buida’s novels—Ermo and The Third Heart—play on themes from Vladimir Nabokov’s fiction. Buida’s Places: Born in Znamensk, Kaliningrad region, studied at Kaliningrad University. Moscow since 1991. The Word on Buida: Kirkus called Buida’s Zero Train, in Oliver Ready’s translation “A rich, provocative allegory (which might be compared with Victor Pelevin’s The Yellow Arrow)—and a fine introduction to an important contemporary Russian writer.” On OpenSpace.ru, Kirill Glikman praised Buida’s ability to tell a big story while offering “small, autonomous plots” in Blue Blood. Buida on Buida and Writing: In a 2010 interview for Private Correspondent, Buida says he doesn’t have a specialty but says his genre is stories, that he’s a storyteller who tells stories, novellas, and, occasionally, novels. He later adds that the short story is “different in all respects: you don’t get glory, money, or attention from publishers. And a lot of energy goes into a good story and the result—in terms of reader attention and money—is next to nothing.” It should be noted that Buida doesn’t sound like he’s complaining: he says later that the best way to raise demand for short stories is to write good stories, adding that it’s too bad for the Zeitgeist if the short story’s not in demand. Buida Recommends: In 2009, Buida compiled a list of favorite stories and storytellers. If asked to choose only five, he says he’d take: Kleist’s “The Beggarwoman of Locarno,” Poe’s “The Gold-Bug,” Hawthorne’s “Wakefield,” Chekhov’s “Student,” and Akutagawa’s “In a [Bamboo] Grove.” When asked in an interview about contemporary Russian writers, Buida mentions having enjoyed works by Vladimir Makanin, Oleg Yermakov, and Vladimir Lorchenkov. Blue Blood – Student Booker, winner, 2012; Big Book Award, finalist, 2011; won third reader prize. Yasnaya Polyana Award, finalist, 2012. Anthologies: “Sindbad the Sailor” is included in Russian Short Stories from Pushkin to Buida (Penguin, 2005, tr. Oliver Ready) and two stories, “More and More Angels” and “The Samurai’s Dream,” are both in 50 Writers: An Anthology of 20th Century Russian Short Stories (Academic Studies Press, 2011, tr. Valentina Brougher, Frank Miller, Mark Lipovetsky).